Why Do Cats Stick Their Tongue Out? Should you be worried? We take an in depth look at the reasons cats stick their tongues out. Cats have all sorts of cute and peculiar behaviors. 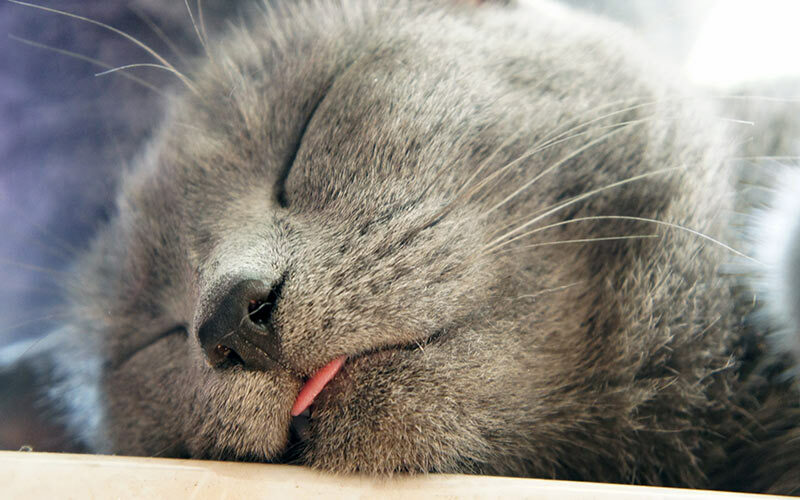 But I think seeing the little pink tip of cat tongue sticking out is one of the cutest and most peculiar. Especially when she just seems to be staring into space. This spectacle even has its own slang name now – blep. Search on twitter with #blep for a feast of adorable cat tongue tip photos. But why do cats stick their tongues out? Should we ever be concerned about it? And why does it always make me laugh when she has that look? In this article we’ll answer these questions (well, maybe not that last one). First, let’s take a closer look at our cat’s tongue. 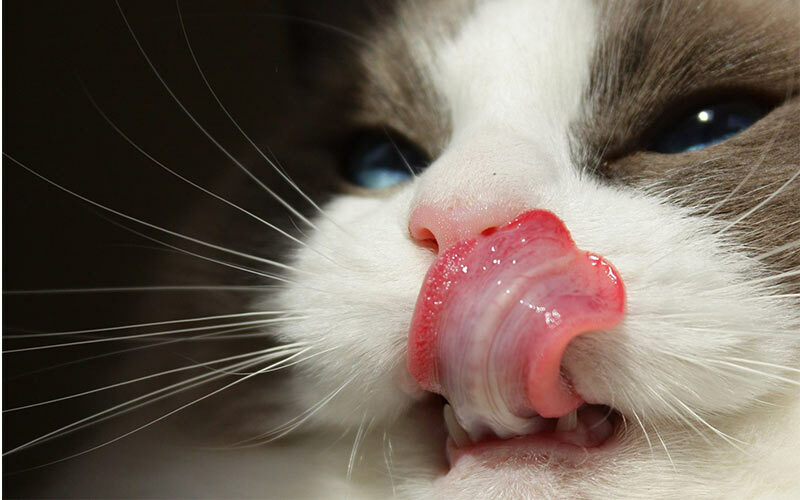 Your cat’s tongue is the perfect tool to aid in eating, grooming and maintaining general health. Unlike your tongue which is relatively smooth, your cat’s tongue is covered with little barbs called papillae. These are stiff spines that curve backwards to snare hair and bits of food. If you’ve ever been licked by your cat, you know the feeling of their rough, dry tongue. This is because the spines are covered in keratin – the same substance your nails are made of. No wonder it can get quite painful when your cat keeps licking you on the same spot. Cats are particular about grooming because in the wild, any trace of scent from their food is an invitation to other predators. When grooming, the papillae collect all the bits of food and loose hair. Once something such as a bit of food or hair is snagged on the barbs, it is difficult for a cat to release it from his mouth. Think about when you get a hair in your mouth. You can use your lips (or your hands) to remove it, but a cat’s paws don’t help much in this department. A cat’s tongue is designed to pull food and hair back into the mouth. The tongue doesn’t allow a cat to spit anything out. They can only swallow and this is why they get hair balls. If your cat is trying to loosen something unsavory or uncomfortable from his mouth, you may see him darting his tongue in and out. But why do cats stick their tongues out sometimes for seemingly no reason? Your cat stops in the middle of what she’s doing and stares into space. Her tongue sticks out and maybe she has a grimace on her face. This usually lasts just a few seconds and doesn’t seem to faze the cat at all. Then, when it’s all over, she forgets to pull the tongue right back in and you get that cute blep. There is actually a good scientific explanation for this goofy behaviour and it’s called the Flehmen response. It’s part of social behaviour in many animals and is used to pick up chemical signals. The Flehmen response happens when your kitty is curious about something – she’s busy analysing some interesting scent she’s picked up. The scent is collected in the mouth and the tongue flicks it up into a special organ called the vomeronasal organ. Scientists believe these chemical cues even play a part in helping cats to feel secure in their environment. When your cat is completely relaxed, he may loosen his jaw just enough for a little tip of the tongue to stick out. In the same way you might see involuntary twitching while your cat sleeps, you might see the little tongue fall out of his mouth while he’s enjoying his shut eye. Your cat can also give you a tongue tip treat when she relaxes while you’re petting her. 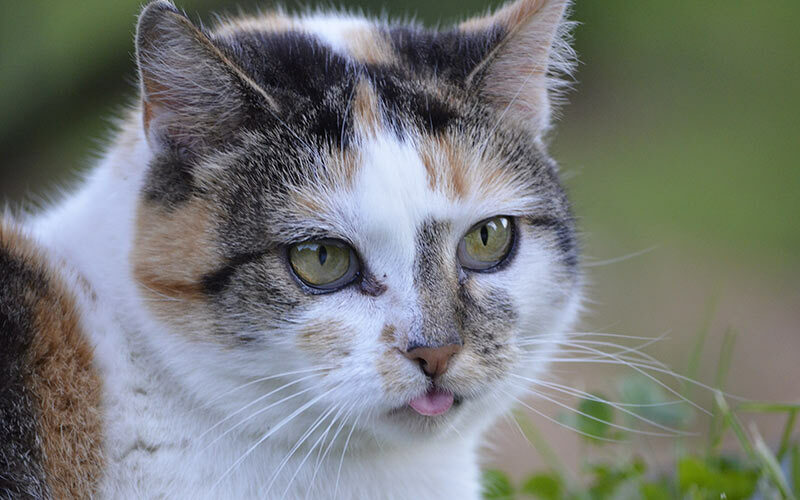 Cats who have flat faces, with less space in their mouths, might stick their tongues out more. Or old cats with missing teeth. A relaxed cat sticking their tongue out is perfectly normal and nothing to worry about. But let’s have a look at when you should be concerned about when cats stick their tongue out. Why Do Cats Stick Their Tongues Out Repeatedly? 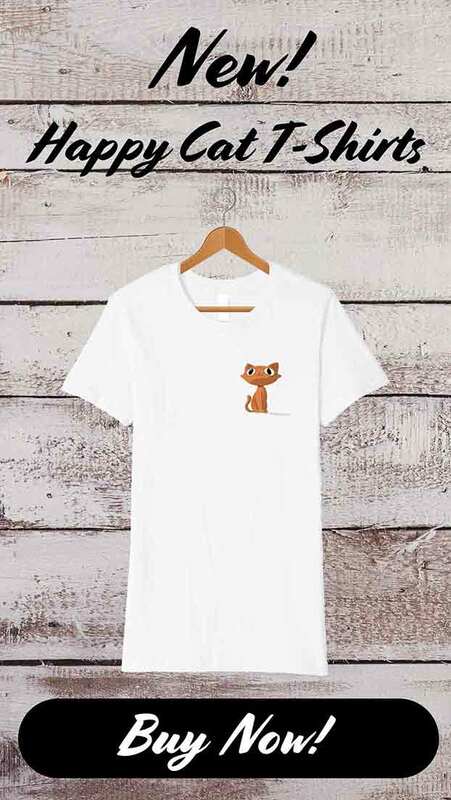 When your cat is sticking his tongue out repeatedly, he may be trying to get a bad taste or food that doesn’t agree with him out of his mouth. While it’s normal for a cat to try and get something unpleasant or hurtful out of his mouth, it is not normal for it to last more than a minute or two. If you see this behavior, check for sores or something stuck in the cat’s mouth or teeth. A kitten could even act like this while it’s trying to loosen a baby tooth. If the mouth is free of any lesions or blockages, this behavior shouldn’t carry on. 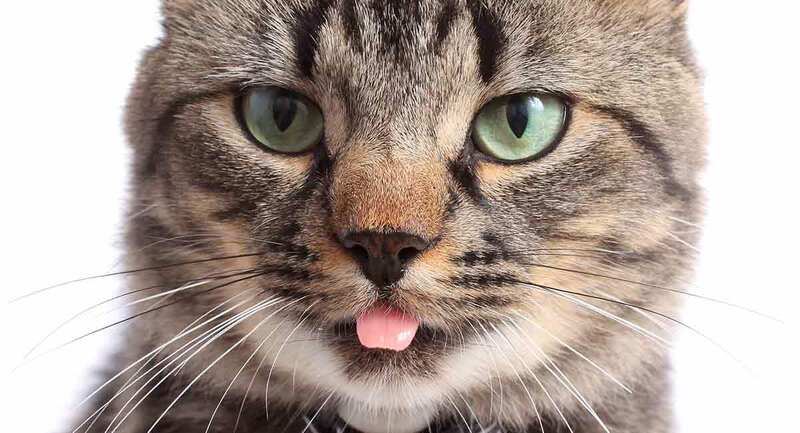 Particularly in older cats, repeatedly darting the tongue in and out or the inability to keep the tongue in the mouth may be a sign of dementia. This should be addressed with your cat’s veterinarian, but you can also read more about it here. Why do Cats Stick Their Tongue Out and Drool? My cat’s tongue is always on the go because he is a compulsive licker. He licks our other cat, he licks my arm, he licks his toys. Since he has a clean bill of health, I don’t worry about his drooling. Cats produce saliva and, if they’re licking a lot, the saliva can run out as drool or slobber. Some drool is not a concern but there are times when you should take note of your cat’s tongue hanging out and drooling. Periodontal disease is a common cause for cats’ drooling and having their tongue hang out. They get plaque build-up on their teeth just like we do. Eventually the plaque hardens and causes inflammation of the gum tissue and build-up of bacteria (gingivitis). The next phase is damage to the bony and soft tissue of the teeth (periodontitis). Once the bacteria get into the root of the tooth a dental abscess develops. Besides tooth decay a cat could also have a chipped tooth. All these conditions lead to painful inflammation in your cat’s mouth. When it’s uncomfortable for your cat to close his mouth, you may see him hanging out his tongue and drooling. You will see the same reaction if your cat develops feline stomatitis. With this condition a cat has inflammation and ulceration of the soft tissue of his mouth – gums, tongue, cheeks and the back of the mouth. Symptoms of feline stomatitis include excessive drooling, inability to clean or eat, inability to close the mouth, and panting with the tongue hanging out. If you suspect that your cat’s tongue is sticking out because of problems in her mouth or teeth it’s time to visit your vet. You can prevent these conditions by taking care of your pet’s dental health. To aid kitty’s dental health, you can switch to a specially formulated dry food such as Hill’s Science Diet Adult Oral Care, which is designed to reduce plaque and tartar. Or offer snacks of Feline Greenies Dental Cat Treats, which also serves as a breath freshener for cats! A further reason why cats stick their tongue out is overheating. 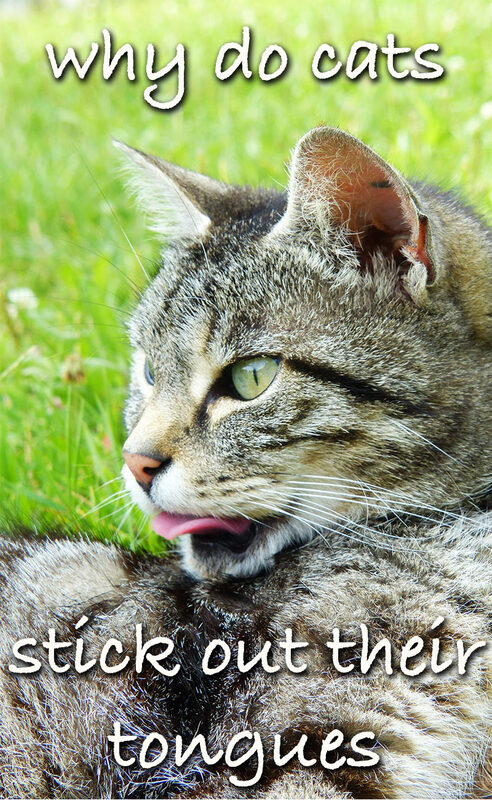 Why do Cats Stick Their Tongue Out on Hot Days? Cats cool down through their foot pads and their tongues just like dogs do – they just don’t pant as obviously. Pay attention when cats stick their tongues out for a while – they may be trying to regulate their temperature. This can happen on very hot and humid days, when they’re in a hot car, after having exercised and when they are ill and have a fever. Panting with their tongue out is not a very effective way of temperature regulation for cats. Elderly, obese and flat-faced cats, such as the Himalayan, cool down even less effectively. A cat’s normal body temperature is 101 to 102 degrees Fahrenheit. When it goes goes over 105 degrees Fahrenheit cat’s are at risk of heat stroke. Cats with heat exhaustion will pant with their tongue sticking out, and become restless. Later they drool a lot, lose their balance, vomit, and can collapse. Heatstroke is a serious emergency because it can cause general organ failure. You will have to cool your cat down gradually and take her to the vet as soon as possible. Never leave your cat in a car – even if it is not a very hot day. Make sure your cat always has access to shade and enough fresh water. A great way to get reluctant cats to drink is with a cat water fountain. Why Do Cats Stick their Tongues out While Travelling? Just like with people, cats can experience motion sickness. If your cat is going for a car ride you might catch him sticking his tongue out, drooling and panting. The reasons for motion sickness in cats can include fear of the unfamiliar surroundings, an inner ear imbalance which makes your cat feel dizzy when the car is in motion, or even an upsetting memory of a past bad experience. The tongue wagging should subside once kitty is out of the vehicle and back at home. Cats who come into contact with pesticides, household cleaners or poisoned prey animals are susceptible to poisoning. There are many symptoms associated with a cat being poisoned. For instance, your cat may drool excessively and stick his tongue out to rid the mouth of the irritant. If you know your cat has encountered a poison or if he shows other poisoning signs such as vomiting, dizziness or difficulty breathing, consult your veterinarian or the Pet Poison Hotline immediately. Your cat is also susceptible to infections of the nose, throat and sinuses, all of which can make him drool excessively and stick out his tongue. Particularly if he is having difficulty breathing, his tongue will wag as he tries to draw breath. If you suspect a respiratory infection, look for other signs such as a fever, tearing eyes, shortness of breath, poor balance or lack of interest in eating and grooming. Visit your vet if you think your kitty might have an infection. Do you have a cat that sticks its with tongue out? Your cat’s tongue is designed to trap food and hair which makes it very difficult for him to rid his mouth of anything unpleasant. Cats are susceptible to dental disease, heat stroke, poisoning, motion sickness and other diseases and infections which may cause them to stick out their tongues. Your cat sticking her tongue out now and then, followed by a blep, is endearing and quite normal. It provides a good opportunity for a social media photo op. A tongue sticking out for a while with excessive drooling, or the inability to retract the tongue properly, should be addressed with a health care professional. Gfeller, R. & Thomas, M. 2015. Hyperthermia (Heat Stroke): First Aid. Veterinary Partner. VCA Hospitals. Common cat dental problems. VCA Hospitals. Vitale Shreve, K.R. & Udell, M.A. 2017. Stress, security, and scent: The influence of chemical signals on the social lives of domestic cats and implications for applied settings. Applied Animal Behaviour Science.